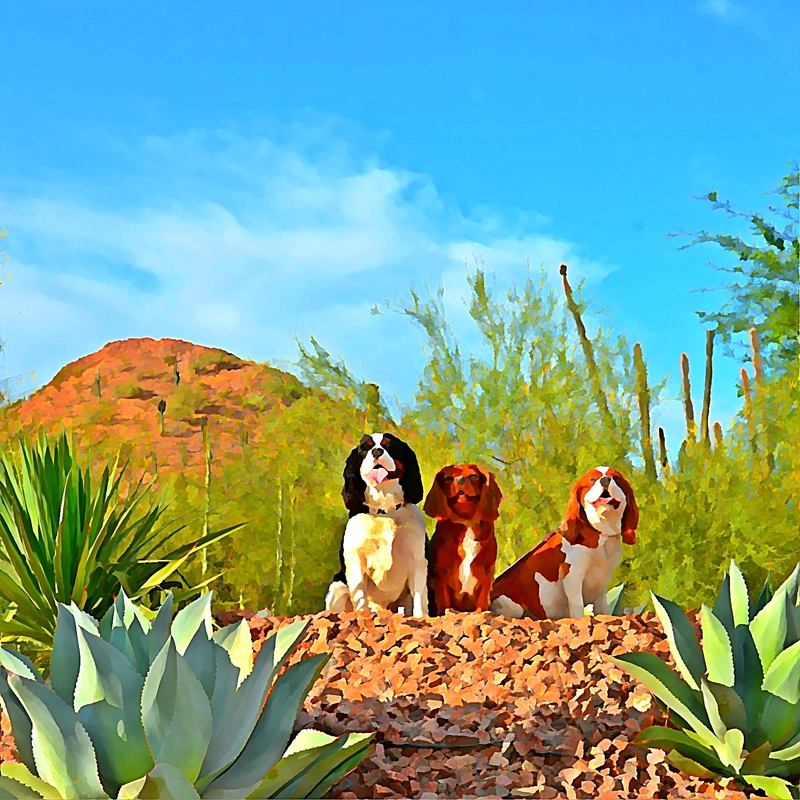 Happy, Lucy and Lady enjoy the views at the Desert Botanical Gardens during Dogs’ Day at the Garden. Join us! Put your paws together and come on out to the Desert Botanical Gardens’ Dogs Day, Sunday, November 16th! This is a wonderfully unique event, 8AM – 2 PM, to which you can bring your dogs and explore this magical place. Naturally, we will be there. Come meet Cavalier King Charles Spaniels Happy, Lady and Lucy, who will be signing their latest book, It’s a King’s Life: Holiday Edition. Read all about their escapades for the Christmas holidays, including their very own rendition of The Night Before Christmas. They can’t wait to meet you and have you share in their fun. The King’s Life books are a travel adventure series about dog-friendly places. The artwork is photography that has been digitally illustrated to look like paintings – something very rare in the children’s book genre. Dan Merchant is the artist and a professional photographer, who was published at a young age and has honed his colorful art skills over the years. Dan is the chief illustrator of the King’s Life series, as well as a series for The Phoenician resort, which is also featured in the Holiday Edition of the King’s Life series. If you would like to learn more about commissioning a special children’s book for your organization, please contact Dan Merchant or Emily Randolph at Happy Lady Books: 480.656.7388. By Emily Randolph, owner of Happy Lady Books and an award-winning author of children’s books for luxury hotels and resorts, as well as the author of the ‘It’s a King’s Life‘ kids’ book series about very special, dog-friendly places. This entry was posted in Desert Botanical Garden, Discover The Phoenician with Phoe-Phoe & Friends, dog friendly, dog travel, dog travel, Dogs, Dogs and Children, Happy, Happy Lady Books, Happy Lady Productions, It's a King's Life, It's a King's Life in Apen, It's a King's Life in Carmel-by-the-Sea, It's a King's Life in Phoenix, It's a King's Life: Holiday Edition, King Charles Cavaliers, King's Life, Lady, Lucy, Phoenician Resort, Photo Illustrations, Scottsdale, The Phoenician, Vacation with your dog and tagged Cavalier King Charles Spaniels, Cavalier King Charles Spaniels Happy, children's book, Dan Merchant, Desert Botanical Gardens, Dogs' Day in the Garden, Emily Randolph, Happy Lady & Lucy, Happy Lady Books, The Phoenician. Bookmark the permalink.